As you can see, they didn’t even survive long enough to take pictures. 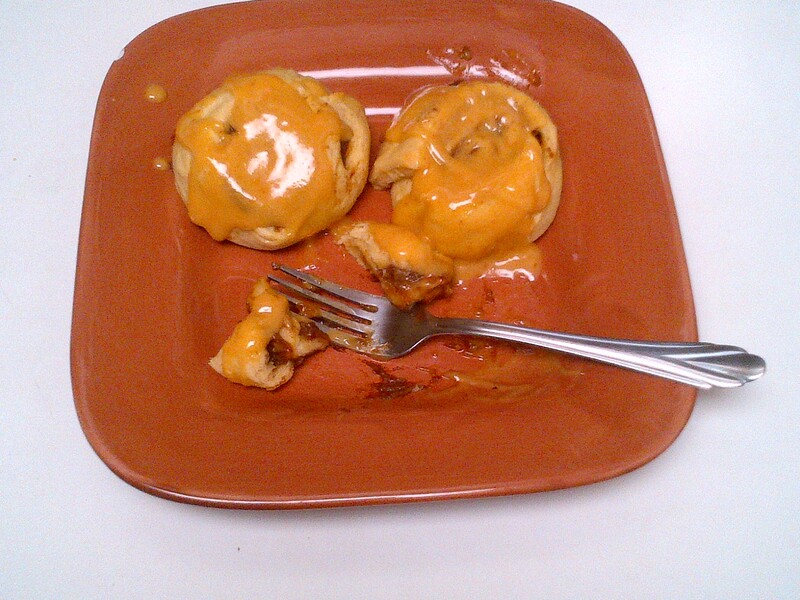 I’ve seen SO MANY recipes using crescent rolls to make cinnamon buns. It’s simple and quick. Why not add some pumpkin to make it doubly delicious for Fall? 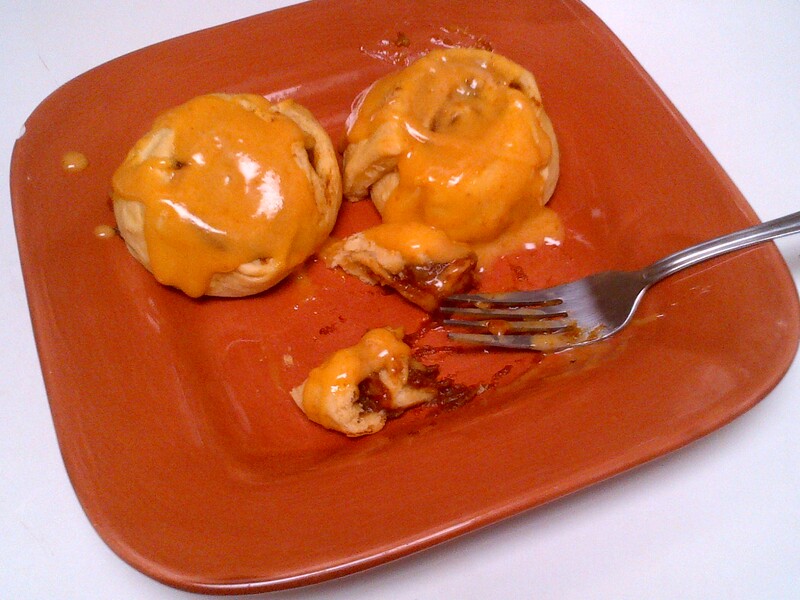 AND a freakin’ Pumpkin Cream Cheese Glaze on top?!?! Yes. I adapted this recipe and cut it in half for the rolls. I used too much cinnamon… It all dumped out at once. Oops. Oh well. I heart cinnamon. This is an easy recipe to modify, anyway. You want more cinnamon? Go for it. Like more sugar? Toss another tablespoon. No harm done. p.s. The pumpkin cream cheese frosting is my own concoction. Mix all filling ingredients together (pumpkin, sugars, and spices) and set aside. 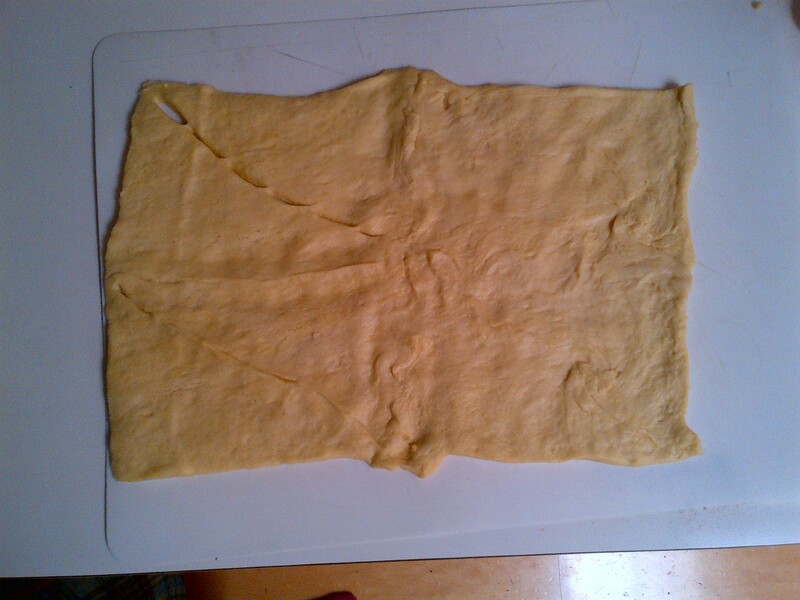 Unroll crescent roll dough and pinch together all of the perforations, making sure there are no holes. You should have a large rectangle. Spread pumpkin filling over dough rectangle, leaving space on one end. Carefully roll up dough, starting at the end with no space. Pinch the seam together. Now to slice them. For this I used a piece of thread- worked it under the roll, crossed the thread above, and pulled. Nice and clean. Or use a (very) sharp knife. Slice into about 1/2 inch to 3/4 inch rolls. 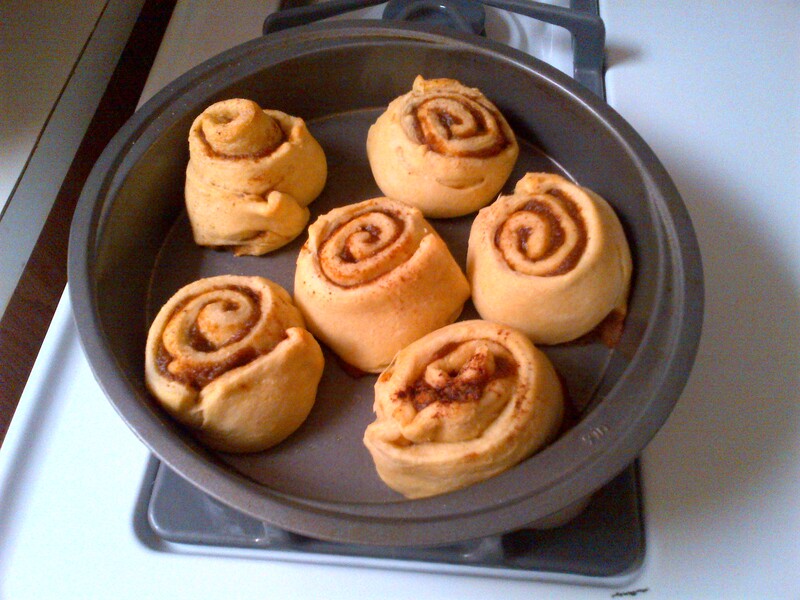 Place each roll onto prepared baking sheet, and bake for 11-13 minutes, until golden brown. In the meantime, make your glaze. Mix pumpkin puree and cream cheese in a bowl. Add powdered sugar a 1/2 cup at a time until you get your desired taste and texture. I also added a dash of pumpkin spice, just for the heck of it. Pour glaze over warm rolls and get to nommin’!! 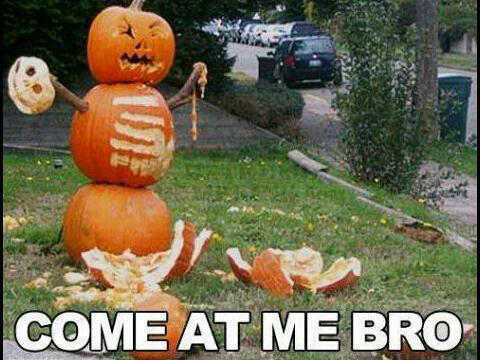 Have a delicious and safe Halloween!! !